This letter was written to the appropriately named seventh daughter of Thomas Mann Randolph and Martha Jefferson Randolph. The granddaughter of Thomas Jefferson, Septimia Anne Randolph was born at Monticello and spent her first 12 years there. It is possible that she suffered from tuberculosis. In this letter Till inquires about the pain in Septimia’s breast. For more on Septimia Anne Randolph Meikleham, see the Jefferson Encyclopedia. 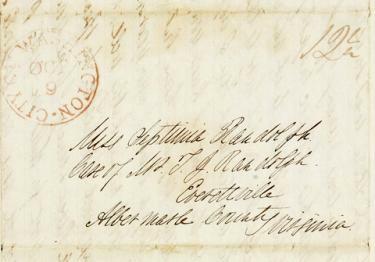 Randolph-Meikleham family papers, 1792-1882, Accession #4726-a, Special Collections, University of Virginia Library.